"Sometimes I find it frustrating to talk to you. Half the time, I try my best to hold my tongue because I don't want to hurt you. At times, I don't understand how you can't see what I see, or feel what I feel. Perhaps it is the measuring of you against an impossible standard, the holding of past mistakes we all make that affects the present. This is my mistake, the mistake of a young man who thinks that he knows better, when he is nothing. I hope you can forgive me for these moments of indiscretions, f0r I realise that no matter my thoughts and feelings, no matter how far I've been away from you, I have always loved you and been very fond of you. I still do love you very much, and will continue to do so. The times we spend together may be diminishing by the year, but I cherish every single moment, be it a drive home together from FACT or a teh tarik at Darba. It is these moments that somehow convince me that, yes, we are still together as a family, that we are a family. Whatever else may happen, I hope that you know you inspire me. Once was the time I do not wish for people to know you are my father, for I did not want to live under your shadow. It felt like every mistake, every step I make was scrutinised further because I am your son. I was happy being away precisely because nobody knew who I am. 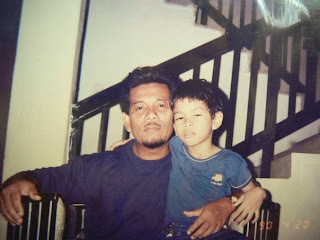 Now, however, I could be prouder of having your name in mine, of being the next in line of your and our family, who came from Jawa long ago, of being known as anak Dr Mahadi. It is not a shadow to live under, but a light that shows the respect people have for you. If I achieve even half of that, I would die a happy man, because come what may, you are my father, my hero, and I would not have it any other way. Selamat Hari Jadi, Bapak, and Selamat Hari Raya. I love you and miss you very much." a 1000 words can paint a picture. It is the humble realization of speaking and being heard.